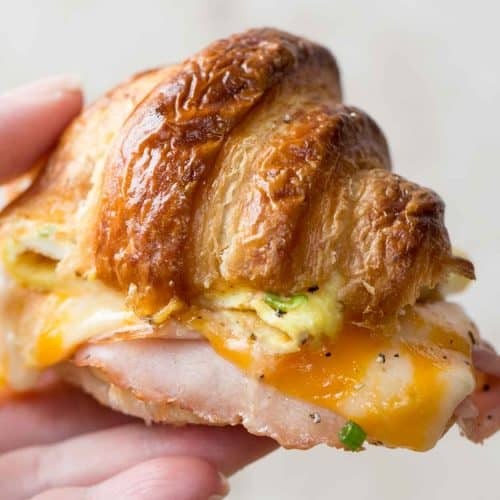 This Ham and Cheese Croissant Breakfast Sandwich is everything you could ask for in a breakfast sandwich. Croissants with egg, ham, and cheese smothered with a delicious homemade honey mustard sauce. The recipe is amazing and kids request it as often as they do Pancakes. These sandwiches are great to make when you need a good breakfast. 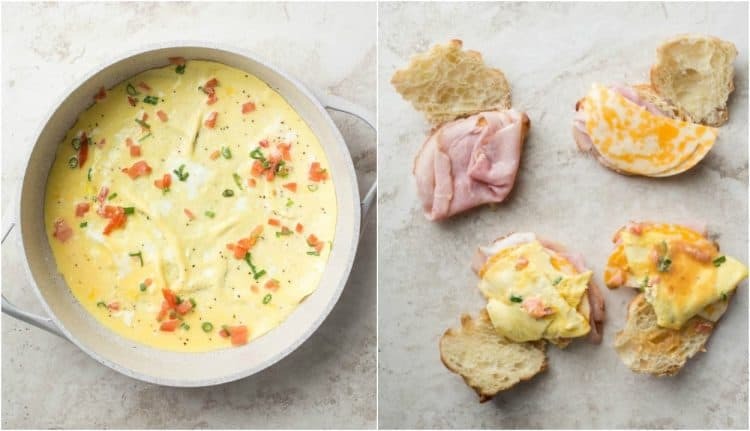 It’s our go-to recipe when we have guests along with our One Pan Breakfast Recipe. A hearty and filling breakfast is a must, and this sandwich is just that. The flaky crispy croissant sandwiches are loaded with egg, cheese and ham in the most amazing creamy honey Dijon sauce. The flavors come together and create the most amazing of combinations. McDonald’s breakfast sandwiches and Starbucks can’t even compare to the taste of these homemade sandwiches. In a bowl, whisk together the eggs, milk and sour cream. Lightly season with salt and pepper. In a large skillet, over medium, heat the butter and oil. Add the egg mixture, add the diced tomatoes and onions, close the lid on the skillet. Cook until the eggs are almost fully cooked. Meanwhile, prepare the honey Dijon sauce (honey mustard sauce). Whisk together the mayonnaise, honey, Dijon mustard, paprika and hot sauce. Slice croissant in half lengthwise. Cut the eggs into 6 equal parts. Add ham, cheese, egg and top with sauce (you may need to fold the egg if it’s too large for the sandwich). Bake croissant sandwiches in the oven for 15 minutes at 350°F, or until tops of croissants are crispy and cheese melts (cover towards the end of baking if cheese needs more time to melt). TIP: Don’t overcook the egg mixture, it will taste too dry. It’ll finish baking in the oven. can I make breakfast sandwiches the night before? 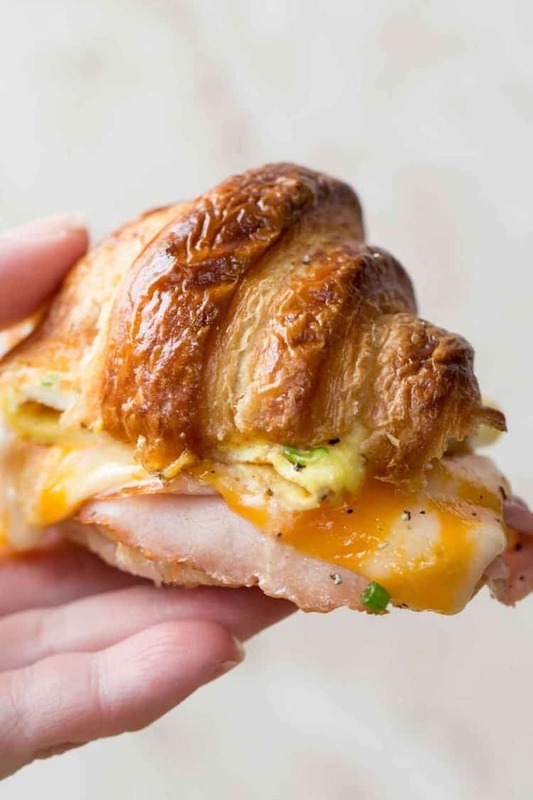 Yes, these croissant breakfast sandwiches are great to prepare the night before. Completely follow instructions, just DON’T bake the sandwiches. Add them to a casserole dish and cover, refrigerate. In the morning, just bake as instructed. Perfect for busy mornings! can I freeze breakfast sandwiches? Yes, these croissant sandwiches are great for freezing. Freeze sandwiches in individual bags and thaw as needed. Or wrap an individual sandwich in plastic wrap and then place all the sandwiches in a large freezer bag. Thaw sandwiches and bake in the oven, toaster oven or you can heat the sandwiches in the microwave if you don’t care for a crispy croissant. can breakfast sandwiches be reheated? Yes! These breakfast sandwiches are great to reheat. Cover in foil and reheat in a toaster oven or the sandwiches can be reheated in the microwave. Breakfast is the most important meal of the day and it’s my absolute favorite to prepare for my husband and children. Maple Pecan French Toast Casserole-the most amazing combination. Sausage Potato Breakfast Casserole- so satisfying and filling. Breakfast Avocado Egg Sandwich- for the avocado lovers. 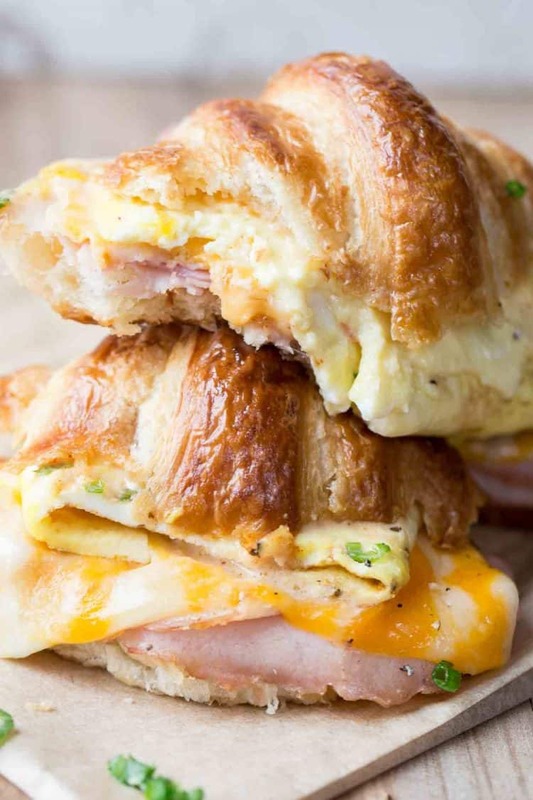 Croissant breakfast sandwiches with creamy egg, ham and cheese smothered in a delicious homemade honey mustard sauce. The sandwiches are baked until crispy. In a small bowl, combine eggs, milk and sour cream, season with salt and pepper to taste. Chop tomatoes and finely chop green onion. Cut the eggs into six equal parts. Combine all the ingredients for the honey Dijon sauce. Set aside. Slice croissants in half. Top one side with ham, cheese and egg. Evenly distribute sauce between all six croissant sandwiches. 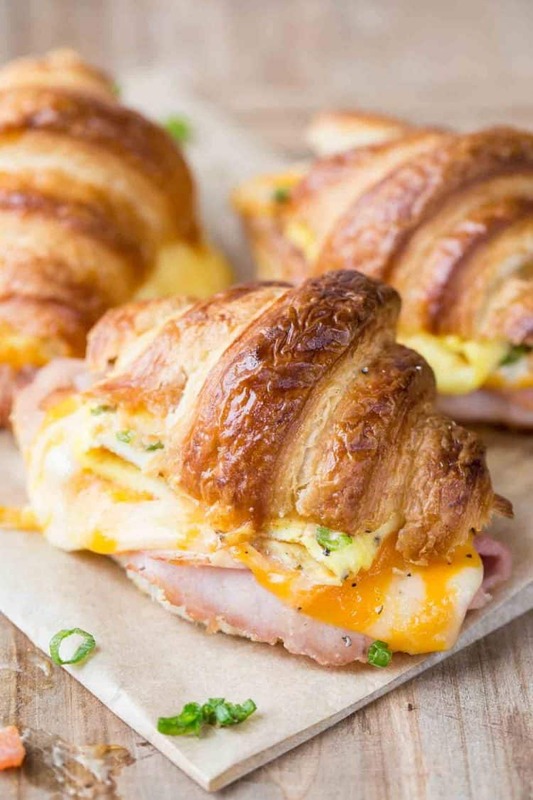 Oh my goodness, these ham and cheese croissant sandwiches would be perfect for an Easter brunch and any other special occasion breakfast. I love, love, love this idea! I am totally loving the idea to enjoy the breakfast sandwiches for Easter brunch, just perfect. Alright, next time I host brunch, these ham and cheese breakfast sandwiches will definitely be on the menu. I love that the croissant sandwiches can be prepared the night before. That’s going to same me a lot of time in the morning! Thank you, Valya! Val, we love having fresh croissants on Saturdays at brunch. I love the the stretchy cheese and ham in the croissant. Thanks for such an awesome recipe! That’s such a neat tradition, NatD. I love it. You’ve gatta try these sandwiches one of those Sundays, they’re great! I am drooling looking at these photos of your breakfast sandwiches! So so delicious! Thank you, Taylor. The sandwiches taste even better than they look. 🙂 Can’t wait for you to try them. Breakfast sandwiches are the best! Love making these at night so my kids have something hearty to eat on the way out the door! Um…. YUM! I have never met a breakfast sandwich I didn’t like! Thanks so, Kim! I hope you love these as much as we do. Hi Valya, my kids love grab and go breakfast sandwiches for the week and I’m so excited to try these! Do you think I can make these with English muffins instead of croissants? Can I also substitute bacon in place of ham? Our kids love these kinds of sandwiches as well! I am totally loving the idea for English muffins with bacon. The sauce would do great with both! This recipe looks delicious. What a delicious breakfast sandwich. These look amazing! My family is going to love them in the morning! Thanks, Julie! That makes me so happy. Enjoy.